Sculpture Size: 18 X 8.5 X 6 in. A great sculptural piece, “Dinner for Two” makes a wonderful centerpiece for your collection. Lots of Tim’s frogs look upward—give them something to look up at! Like the red caterpillar dangling by a thread, about to drop into the waiting mouth of a hungry green frog. 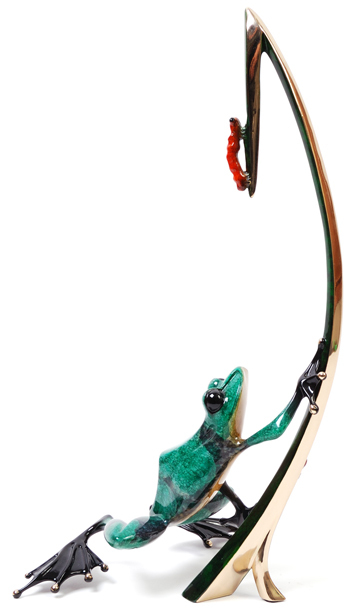 Two ladybugs are enjoying dinner also, hidden on the back of the grass blade that’s highlighted with polished bronze accents.